The neighbourhood of Gràcia is just one stop up from the top of Passeig de Gràcia but it feels like a whole different world. Gràcia was an independent town until the late 19th century and even now the community is small and tight. The people are exceedingly proud of their roots, they don't say they come from Barcelona, they say Gràcia. 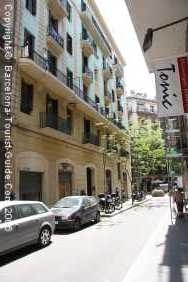 The area is popular with artists and a generally bohemian crowd, it also has a high ethnic population and the highest concentration of foreign restaurants in Barcelona. Plaça de Sol is the most renowned area of the neighbourhood, it's lined with terrace cafes and at night this is where the people convene to drink and be merry. However despite the trendy nature of Gràcia it is also a traditional barrio with a large elderly population which makes for an amusing and odd mix - and entertaining people-watching. Gràcia is also well-known for it's festival which is held for 5 days in August and sees the locals competing in street decoration (they take it quite seriously). The results are usually spectacular, and at night the festival comes alive with drinks stalls and stages of live music of every variety. Fontana is the metro stop, and from there you can get into the centre of the city, Plaça de Catalunya in less than 10 minutes. Also near the metro stop is a cinema that plays films in their original language (version original). Gràcia is totally self-sufficient. That is to say you could stay in Gràcia and never have to leave, there are good amenities of every sort, bars, cosy cafes, a real Mediterranean lifestyle. Whilst everything like the buildings, streets and plaças are in much smaller scale than those in the centre of town there is some striking art nouveau architecture to be seen. Whilst I suppose one could find some of the trendy population quite intimidating (there are a lot of piercing, dreadlocks and tattoos around) the area is quite safe and away from the main squares where people drink outside until the early hours it is also quiet. The area is perfect for those who want something a little bit different, those who perhaps have been to Barcelona before and want a different tourist experience. 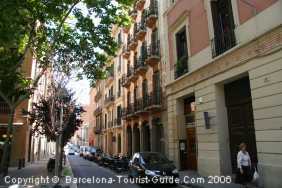 Although really because central Barcelona is so easily accessible from Gràcia it is suitable for everyone. One of the best features of Gràcia is that there are not so many tourists so you feel like you've discovered something a bit new and diverse.